/ Home / Press office / PR features / Careers and employability: Five titles in eight years qualifies as a dynasty, doesn't it? 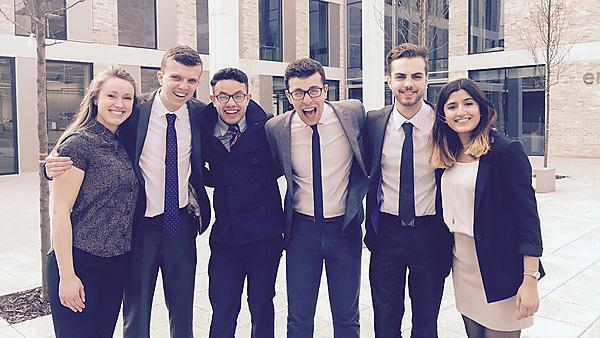 Plymouth’s remarkable run of FLUX wins – maintained this year by the Igniting Enterprise team – has become a genuine talking point for competing universities. Whatever the challenge set before our students, whether it’s to design a bridge and associated marketing campaign for the city of Lancaster, or create a new concept for wearable technology, we’re ahead of the game in providing the answers and pitching them to the judges in a compelling fashion. “Undoubtedly, in the context of FLUX, we’re producing competition-ready teams because we’re putting them through rigorous qualifying events at faculty and university level,” says Shirley Walker, the University’s Head of Careers & Employability. For Shirley and her team, the work to support greater student and graduate employability is taking shape across a number of major projects that serve to sharpen the focus on the ‘core business’ of career’s advice, placements and jobs. Some are intrinsic to the University’s pedagogy or services; others gaze outwards to the business community, framed through the University’s Growth Acceleration and Investment Network (GAIN). All are linked by the ‘golden thread of connection’. Among these major projects is Catalyst, a graduate recruitment and internship service, which launched in October 2014. Through Catalyst, final year students and recent graduates can access live employer opportunities and vacancies, and tap into training and resources in areas such as interview techniques and CV writing. The Catalyst team liaises directly with employers, and even replicates the role of an internal recruitment agency by holding pre-selection tests for students and graduates. The internship aspect is part-funded by the Santander Universities programme, with local companies offered £1,500 towards the cost of the salary, and there are close links with the GAIN programme as well. So far, more than 45 South West businesses have benefitted from the scheme, and this year, the University will look to support a further 100 interns. Among those to have already gone through the process are Rebecca Cavanagh and Noreen Jeffries, who undertook placements with Plymouth firm IU Energy, and are now both graduate trainees. History graduate Rebecca works in a business administration role and liaises with the ‘big six’ energy suppliers on behalf of her clients. Now studying part time for her Chartered Institute of Marketing Diploma in Digital Marketing, she is supporting IU Energy’s marketing strategy. Noreen studied a civil and coastal engineering degree, followed by a masters in sustainable environmental management. Her role at IU Energy involves detailed surveys to establish how much energy a business is using and devise ways for it to reduce that consumption. Many of the projects underway look to internal partnerships to create new employability opportunities. The Graduate Attributes Framework and the Curriculum Enrichment Project are both major Teaching and Learning programmes that have significant employability elements embedded within them. Another example is an online alumni network, to be officially launched at graduation, which involves close collaboration with the Alumni Engagement team within the Development Office, as well as the Devon and Cornwall Business Council and the Plymouth and Devon Chamber of Commerce. Powered by a piece of software known as ‘Aluminate’, students can search the network for people with particular specialisms (or even locations) and then send them a connection request. Aluminate is synced to LinkedIn, so when an alumni updates their profile on LinkedIn, it automatically updates on the database. “Stage two will see us offer it up to prospective students, who can connect with current students, and then step three will be to launch this to all businesses in the region,” says Shirley. Also on course for a September launch will be the revamped Careers & Employability Hub, which will make some significant adjustments to the support services delivered from the space on the ground floor of the Roland Levinsky building. Based on extensive consultation with students and staff, the facility will replace the ‘one stop shop’ approach with a hub-and-spoke model, creating a ‘job shop’ in the area currently known as The Commons, where employers can come in to hold careers fairs and assessment centres. “We know that students were confused about what Gateway/The Commons offered,” Shirley says. “It had become too noisy for confidential conversations and we started to see the footfall reduce. Even the name ‘Gateway’ can have negative connotations for international students as it can signify some sort of barrier. All of this work supports the University’s institutional focus on employability, such as the launch of the Higher Education Achievement Report (HEAR) and the work being conducted in analysing league table performance. In particular, while the University continues to thrive in the Times Higher Education tables (where research is an important metric), it has fallen in those that place heavy weighting on the destination of leavers. Bringing together the graduate recruitment and internship programme that is Catalyst, with the Santander Internships programme, and ensuring both are aligned to GAIN. The Student Jobs programme offers employers the chance to advertise part-time and contract work free of charge on campus. Introducing FLUX competitions within faculties (and there are plans to hold them at an even more granular level) is producing battle hardened teams who understand the process. This year’s national FLUX champion, Igniting Enterprise, had to qualify through both a faculty event and then the University final. Local companies such as Babcock Marine have been hugely supportive and have provided mentoring support – and even internships and graduate trainee positions – for some team members. Several aspects of the CEP focus on employability, such as the School of Geography, Earth and Environmental Sciences working with Antony Jinman’s ‘Education Through Expeditions’ social enterprise, focusing on leadership skills development. A cross-institutional project, led by Professor Debby Cotton, to reintroduce a framework that will define key graduate skills and where they might map onto curricular and extra-curricular activity. It will also help define those attributes that should set apart a Plymouth graduate from counterparts at other universities. The work also feeds into the Plymouth Award. Two networking events are planned for this year, one for STEM subjects and health, the other for arts and humanities – in which targeted employers will be invited onto campus for networking sessions with students. A keynote speaker roundtable sessions. The employers will then move to a different table to ensure that students will have been able to speak to more than a dozen employers by the end of the event. There will be an opportunity to take part in follow-up, informal sessions. Significant changes are being made to The Commons in RLB, transforming it into a ‘job shop’ focused upon careers and employability. A three-step plan to create a network of prospective students, students, alumni and businesses, as well as mentoring and employment opportunities. Two weeks have been planned for the new academic year that will bring together international students for sessions on employability skills. Run in partnership with the Library and the International Student Advisory Service, it will also focus on encouraging domestic students to consider developing their international experience. Weekly workshops held in the Careers & Employability Hub for all students that provide assistance on particular aspects such as CVs and application writing. I first went to Catalyst after seeing a few of their posts on Facebook. It was a real game changer for me, within two weeks I have had three interviews lined up. Every week they gave me new jobs to apply for!